Learn how you can spy or hack someones snapchat it might not get destroyed from their cell phone. How to See When a Text Message was Sent on Your iPhone. In such cases, phone spy software can be your friend for getting the information about the other person in detail. April 04, , 12:53 am A federal court ruling finding in CDOTs favor on Tuesday removed the last potential legal roadblock for... Best way to spy Text Messages from another Phone without Setting up Software Application Some folks might consider spying someone�s text message is a joke. However not all they know that mobile phone spy applications are ideal and can handle various works which appear difficult to manage. In order to see your boyfriend�s messages, you need to install a cell phone tracking device on his phone. We recommend you to inform your boyfriend about possible spying, because it is illegal to monitor adult people. 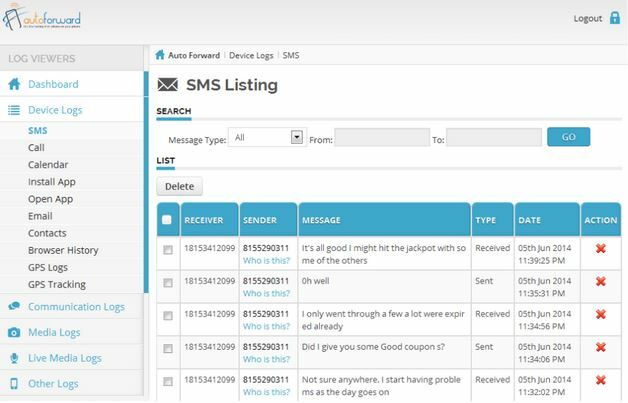 Spy On Text Messages Phone Spy App MxSpy. Method two: Copy and paste the text messages from different senders to another phone/emails. If you want to forward text messages from different senders like from my friends, families, colleagues, etc. to another phone or phones, then you can try this method. Hack A Phone To Read Text Messages 2018 Androrat is an open source tool that allows a remote attacker to control your phone. With the software the hacker is able to make calls, send messages, get GPS coordinates, access files and photos stored in the phone.